Many of Life’s An Adventure’s Tasmania walks start and end in Hobart. And no doubt you’ll want to get there a day or two before your walk so you can experience the old and new splendour of this gorgeous city. 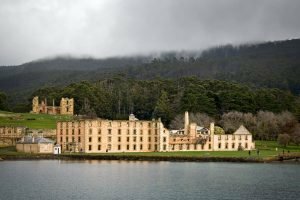 So, here’s our list of things to do in Hobart and surrounds. 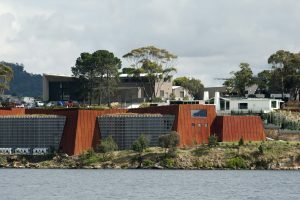 If you fancy exposing yourself to art catch the quick boat ride to MONA – the Museum of Old and New Art and experience something out of the ordinary. It’s the largest privately funded museum in Australia. The museum presents antiquities, and modern and contemporary art from the David Walsh collection. Walsh has described the museum as a “subversive adult Disneyland.” And if that doesn’t tempt your curiosity nothing will! The Tasmanian Museum and Art Gallery – the second oldest museum in Australia – is another great option. The gallery’s collections sit in a stunning contemporary design, integrated with the museum’s heritage buildings. Known as TMAG, the museum’s art collection includes works from Tasmania’s colonial period through to contemporary Australian and international artists. If you love local food and wine you’ve come to the right place! 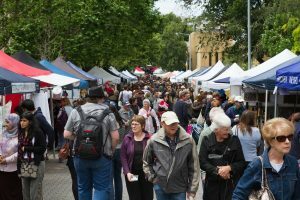 If you’re in Hobart on a Saturday the Salamanca Market is located at historic Salamanca Place, next to the Hobart waterfront and with over 300 stallholders it’s an experience that’s hard to beat. And on any other day there are plenty of shops selling excellent produce in the city’s CBD. Plus there are loads of local pubs and restaurants to choose from. Click here for more info on them. Wellington Park offers great views over Hobart. If you fancy warming up for your Life’s An Adventure walk… with a walk … there are plenty of discovery trails in and around the city – like the 2km Battery Point Sculpture Trail that links nine large numerical sculptures. There’s also the 2.4km Cascade Walking Track in Wellington Park and the 6.7km City to the Royal Tasmanian Botanical Gardens Loop. Want something longer, then try the 9.2km Organ Pipes Circuit in Wellington Park, a wonderfully diverse loop walk, past historic huts, curious geological features and through a variety of vegetation. There are loads of other walks available so get your hands on a local walking guide. Hire a car and drive out to a number of vineyards within easy reach of Hobart. Tasmania’s cool climate, mild summers and long autumn days are perfect for cool-climate wine making. In fact, Tasmanian wines have been winning awards since the 1840s! You’ll find a fine selection of cool-climate wines with Riesling, Chardonnay, Sauvignon Blanc, Cabernet Sauvignon, Pinot Gris, Gewurztraminer and Pinot Noir are all grown here. So take your pick, and take a sip! If you have free time before or after your Three Capes Walks a visit to Port Arthur is a must. This former 19th-century penal settlement and now open-air museum offers a dramatic snapshot of what life was like almost 200 years ago. Ruins include the huge penitentiary and the remaining shell of the Convict Church, which was built by inmates, under much duress no doubt! Solitary confinement cells in the Separate Prison building were used to inflict mental punishment in place of floggings – charming. Now if you’re not on Life’s An Adventure’s Bruny Island walk we still recommend you getting over there. Simply hire a car for the day and drive to the jetty just south of Hobart and hop on the 15 minute car ferry. The island contains an appealing mix of towering dolerite cliffs, long sandy beaches, rich heathlands and eucalypt forests. This wonderful diverse landscapes offers diverse flora and fauna as well as many threatened and endemic species so it’s great to discover on foot. Plus there are plenty of businesses making excellent local produce like cheese, so it would be easy to fill a day exploring this little piece of paradise. For more info on Bruny Island click here.